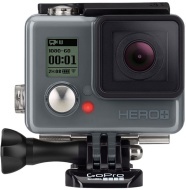 alaTest has collected and analyzed 596 reviews of GoPro Hero+ LCD (CHDHB-101). The average rating for this product is 4.4/5, compared to an average rating of 4.0/5 for other Camcorders for all reviews. Reviewers really like the durability and reliability. The size and price are also appreciated. The memory and battery get negative comments, and there are some mixed reviews about the viewfinder. We analyzed user and expert ratings, product age and more factors. Compared to other Camcorders the GoPro Hero+ LCD (CHDHB-101) is awarded an overall alaScore™ of 92/100 = Excellent quality. alaTest has collected and analyzed 141 user reviews of GoPro Hero+ LCD (CHDHB-101) from Amazon.com. The average user rating for this product is 4.2/5, compared to an average user rating of 3.9/5 for other Camcorders on Amazon.com. Many are less positive about the usability. At $100 less than the Hero4 Silver -- GoPro's other touchscreen camera -- you're definitely saving some coin here, but its streamlined entry-level feature set and design make it less of a bargain. The GoPro Hero+ LCD puts a live-view touchscreen on the back of a camera that's capable of very good 1080p video capture at 60 frames per second. Built-in wireless lets you use your phone or tablet to remotely control the camera. The camera is permanently in its polycarbonate housing; the battery is nonremovable; limited shooting options compared with others in its price range and a significant drop in features and performance from the $400 Hero4 Silver. The GoPro Hero+ LCD isn't exactly a bargain for its entry-level specs, but if you appreciate a streamlined feature set and its built-in touchscreen, it's worth the extra money over the very basic Hero. The Muvi K2 NPNG has more included accessories (and support for GoPro mounts) but the Hero+ LCD has better image quality and a superior companion app. In any case, with both you’re getting very capable action cameras for not a lot of money. GoPro considers the Hero+ LCD an entry-level camera and, looking at its specs and capabilities, it has stripped of much of what you'd find on the higher-end Hero4 Silver and Black models. Excellent price for the product. Longest battery life of any of the GoPro's. LCD screen very useful for framing and reviewing footage if deleting to make space. Compact camera with waterproof casing, lots of fixture options. Sealed unit so can't replace battery If the connector snaps it's basically useless! Great picture quality. Camera is robust and housed in a protective case.